Beautiful Communities Do Not Happen By Chance. It takes a community working together and sharing the responsibility. The Tukwila Code Enforcement Team works to support a safe, inviting, and healthy environment for residents, businesses, and visitors. The Tukwila Municipal Code represents the City of Tukwila’s laws adopted by the Tukwila City Council. Code Enforcement is responsible for enforcing the parts of the Code that relate to conditions of private property (both residential and commercial). 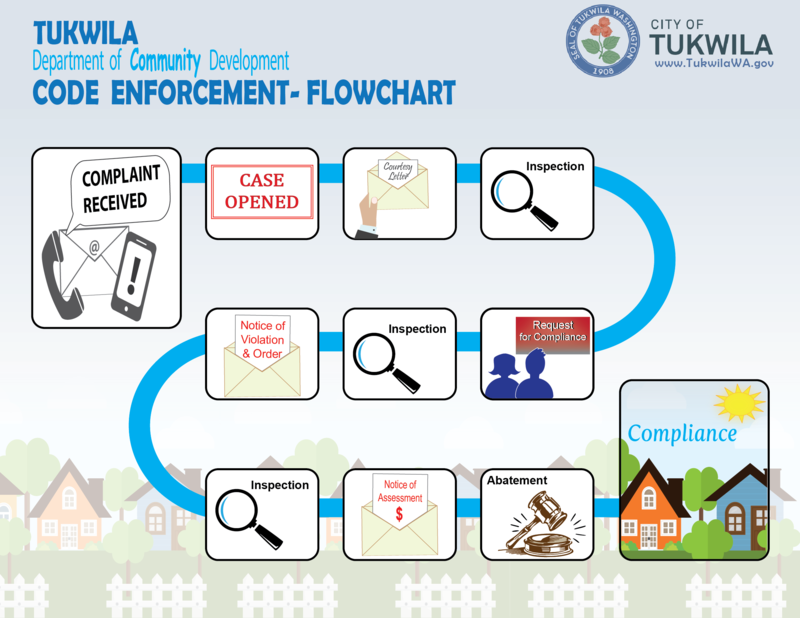 Our Code Enforcement Officers respond to complaints from citizens regarding conditions on private property and encourage compliance with the Tukwila Municipal Code. If a violation is found, a case is opened. Our team works with the property owners to reach compliance. Junk vehicles, uncontained garbage and debris, illegal signs, roosters, construction without permits, and overgrowth are some of the common complaints received and investigated by Code Enforcement. Compliance is typically reached through promoting public awareness, communication, and collaboration. We encourage community members to reach out to our Code Enforcement Team with any concerns they may have related to private property code compliance. Code Enforcement handles many different types of issues but not all.